Please scroll all the way down this page to read everything you need to know about our photo services. Studio Lighting Package: This high-tech and highly-recommended lighting option creates photos with more of a studio effect, adding a powerful, pole mounted, super-bright state-of-the-art LED lighting panel, which adds an soft, yet bright, fill-light that will add brightness to shaded areas, aiding the existing camera mounted flash, in properly illuminating the subject. This may be added, a la carte, to any package, for $300 + tax. PhotoShop Package: Includes the enhancement, correction and optimization of 20 choice images in your set with the majority of the images tranformed to b&w, sepia, colorized or special effect (such as misty/dream look). Any spots or other abnormalities will also be removed. This service costs $300 + tax. 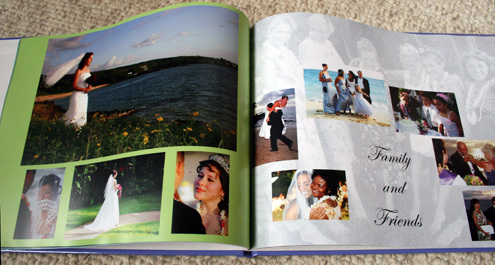 Add basic custom designed photo book = ONLY $295! * Prices are plus 4.167% HI State tax. Prices include: all photos uploaded to publisher, custom professional designing, publishing and shipping. No extra charges. 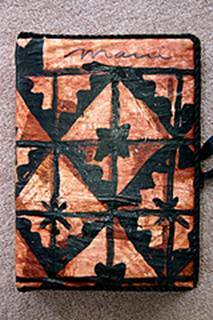 Additional copies only $89.95 per book (recommended to buy at least two copies). 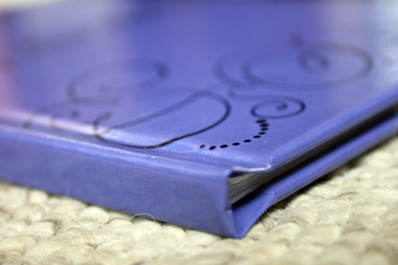 Customer may choose own color theme and words used inside book, if desired. Pictures are in a mix of color & b&w. 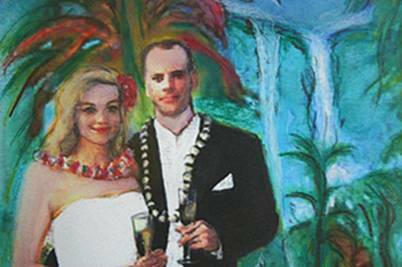 MERRY MAUI WEDDINGS EXCLUSIVE – “One-Of-A-Kine” framed custom painting by Cindy Paulos! 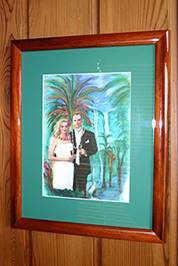 11x14” Artist-rendered painting, matted & framed in Koa veneer, of your favorite picture! = $295!! FULL COORDINATION IS ALWAYS INCLUDED IN OUR “A LA CARTE” PRICING ...SO, NO SURPRISES! 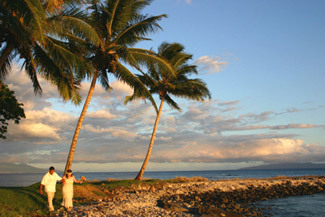 or email us at info@merrymauiweddings.com. All Prices are plus 4.167% HI State ET tax. Prices and terms effective 5/25/11 and are subject to change without notice. MMW photo services include exquisite, high-resolution digital imagery - typically with no prints or albums - provided on photo CD, downloadable from our server, or uploaded directly to your notebook computer after the event. Your Photographer: With each event, a photographer will be assigned for your photography. Outdoor Photography Disclaimer: Due to difficult outdoor lighting conditions sometimes encountered during afternoon photo shoots at West facing beaches or any other location with very brightly backlit conditions or insufficient lighting, complete satisfaction of the photographic result cannot be guaranteed — nor will any refund be made. Photographic services promised/guaranteed are limited to the fulfillment of the agreed upon photo image commitment, (# of images promised based on your specific package). Photo Rights Policy: Our policy in regard to whom retains photo rights to your wedding pictures is simple. We both do. It is our normal policy to share photo rights with you, although we will also make special arrangements for full photo rights release on a case-by-case basis, and, sometimes at additional charge. Normally, however, we permit full and unlimited printing, publishing, displaying and sharing of your images with whomever you please, so long as you state somewhere on the image that the picture was taken by and copyrighted, if you use the picture on a contest or commercially. We do not ask for financial compensation from you if your picture wins you a financial prize in a photo contest. We also will not offer you nor be obligated or liable to pay you a financial compensation of any kind if we win a financial prize from the submission of your photo to a photo contest or if the image is purchased by a media buyer. We routinely retain the right to publish or display your picture on our websites and all other promotional media without explicit permission from the subject in the photo used. Photo (Model) Release Policy: Utilization of our services constitutes your agreement to release any image with your likeness clearly discernable to us for use in promotions or in contests. Our refund liability: In the extremely rare event that there is a technical problem that results in no photographic images being taken or coming out to the satisfaction of the photographer, or, if there is an instance of where your photographer is not able to make it to the event, due to a severe traffic tie-up, disaster, sudden sickness, etc., our refund liability to you is limited. Under no circumstance, shall MMW be liable for more than the purchase price of the photographic service and to a limit of $200.00. Photographic style policy: MMW's photographers employ the very popular “photojournalistic” (candid) style of capturing imagery, mixed with posed photography. Due to this mix of styles, you will receive superb images that capture memorable scenes from the very beginning, throughout, even to the end of the event, if time permits, telling a complete story. Outdoor, real-time photo taking at an event is NOT studio photography. Please do not expect studio photography. Unless you request that you receive some b&w photos, they will all be in color. With each photo shoot, you may request up to 10 b&w/sepia/colorized images at no additional charge, depending on wedding package purchased. However, any individual image can be converted to b&w for $10 per image + tax, or all your images/photos can be b&w for $100 + tax. Over-time policy: There is a 15 minute grace period over the amount of time promised in a photo service. Any overtime over the 15 minute grace period must be purchased. Photo overtime is available for $150 per half hour + tax. Any overtime verbally requested and authorized at the wedding shoot by the bride, groom or their parents, will be charged to the credit card on file. So, please consider any overtime charges you may expect might be necessary, prior to your event. Special shots requests: Please provide the photographer with a list of specific shots you desire captured, i.e. 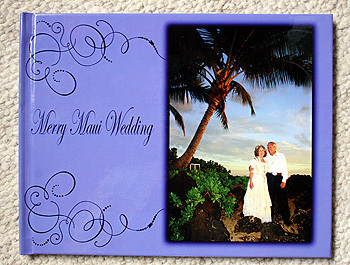 groupings, angles, etc., by emailing your requests to vincent@mauiweddingimagery.com. If you do not like close-ups, for example, please say so prior to the photo shoot. Photo shoot timing and location policy: MMW's photographers will recommend the most idyllic time and angle of photo taking at your event location for optimal photographic results. If your choice of setting, angle of shoot or chosen time is less than idyllic &/or we are not allowed to decide the best angles for photography, you may not be fully satisfied with the photographs. Proper lighting is crucial to great photos. Mid morning, middle of the day and late afternoon outdoor photography is discouraged, as the lighting during these times can be less than idyllic, depending on the location in question. Mid-day lighting is extremely bright and may cast heavy shadows plus the heat causes sweating & eye squinting. At West facing locations, early and mid-afternoon times can have extreme backlight glare from the sun's angled slant. Thus, early morning or 1-2 hrs before sunset offers the best outdoor lighting at West facing beaches. Northshore locations offer the best afternoon lighting. Cloud cover can also cause undesired results due to a brighter background than the foreground or just overall insufficient lighting if the clouds are thick enough or if you are late to your sunset wedding. Any very low light condition will not result in stunning outdoor photography. Thus, we always recommend our Studio Lighting Package to be added to all outdoor photo wedding packages. Photo equipment policy: Event will be shot using a pro-digital SLR camera. The cameras are mounted with a top-of-the-line professional electronic flash on a flash bracket to minimize brown/red eye and achieve the optimal flash angle. Studio Lighting Package: This ultimate, highly-recommended lighting option creates photos with maximum impact. We bring in a powerful pole mounted, wireless controlled studio flash, which adds an extreme lighting punch that cannot be attained by a camera mounted flash. This package can be added, a la carte, to any package for $300 + tax. PhotoShop policy: Most MMW packages DO NOT include any PhotoShop work, nor do the majority of pictures taken usually require it prior to being presentable. However, MMW’s professional photographic staff recommends the purchase of our in-house PhotoShop image enhancement & correction for all photo orders involving outdoor weddings. This process will correct, enhance and optimize every image, which, otherwise, might not be stunning without optimization - especially for sunset weddings and weddings on cloudy days. PhotoShop also can correct irregularities, such as a spot on a dress, for example. PhotoShop work to correct/adjust (with possible enhancement and optimization) of images' brightness, contrast and lightness on specific images to make these images match the other photos in your set costs $150-$400 plus tax depending on size of photo order. Enhancement of all photos in the set or special effects, removal of red-eye or discolorations/spots or an overall lightening/enhancement of the images due to insufficient lighting conditions is considered specialty work and is charged $10 per image, and is done only if customer desires the work be done and is requested by email. PhotoShop Package: Includes the enhancement, correction and optimization of 20 choice images in your set with the majority of the images tranformed to b&w, sepia, colorized or special effect (such as misty/dream look). Any spots or other abnormalities will also be removed. This service costs $300 plus tax. Enlargements policy: With packages offering enlargements, customer is responsible to notify MMW by email which images to enlarge, within 30 days from ceremony date. If MMW does not get notified within 30 days, MMW's photographer(s) reserve the right to choose their own favorite image(s) to enlarge. Photo delivery options + Turn-over time policy: You can choose from 3 methods to have your hi-res digital images delivered to you. The edited photo CD standard option, which is included in all of our packages, has a delivery time of 14-30 days after photo shoot has taken place, including shipping time. We also offer a modern-day service allowing you the option to download your images from our server directly onto your computer's hard disk, for an upagrade charge of only $50 + tax. With this option, your images will be ready for download in 2-14 days and you will be allowed to re-download the pictures a second time within a month, in case you lose your images. If you choose this option, you will have to burn your own CD archival disc, to ensure that your images are properly backed up. Photo Rush Policy: The ONLY way to guarantee that your images (without PhotoShop extras or enlargements) will be available for download in less than our normal processing time is to pay the $100 + tax rush charge. With a paid rush, your edited, choice images will be ready for download from our server in 3-5 days after the photo shoot. For a "Super Rush," which would make your images available for download in 1-3 days, please add $200 to your wedding package, plus tax. The rush does not speed up the receipt of a photo CD in the mail or images involving any PhotoShop work, enlargements, or the custom published coffee table photo books we offer. Photo packages with PhotoShop work, custom photo books &/or enlargements, typically take 14-90 days to complete, depending on size and complexity of order. Picture choosing policy: MMW's will provide you with all remain images after we edit the number down to the very best ones. Once you pick your favorites, you can delete the ones you don't like. 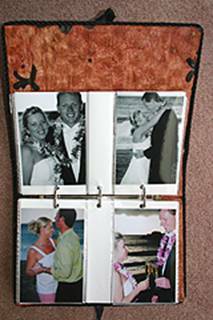 For custom photo books or enlargements, receiving all your images at home allows you the time to choose your favorite images from the comfort of your home. Website gallery policy: Web photo galleries are comprised of our top favorite images from your wedding. They shall be completed within 2 weeks from your wedding date, in most cases, and sometimes in less than 1 week. You will be notified by email when the gallery is completed, and you will be emailed a special email designed to be forwarded to your friends and family, worldwide, with a link to your site, for their easy viewing pleasure. Web galleries are viewable for 3 months after they have been completed, after which they become deleted. You may extend your gallery for 9 additional months, or we can permanently upload the files onto the computer of your choice, for $75 + tax. International shipping policy: If you live outside the U.S., a $50 shipping charge will be added to your package if you wish to receive a photo CD in the mail or have ordered a custom published photo book or enlargements. Due to the additional shipping charges, we suggest choosing the internet download method, which costs the same, but has a quicker turn-over time, and you may download your images twice at no additional charge.